A R T & D E S I G N b y c a n d a c e b r e k k e : Oh So Posh Giveaway! This gal is great and I really enjoy her posts on FB. 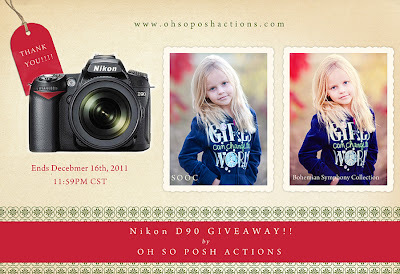 She offers some great action sets and now she's giving back to her fans with a chance to win a Nikon D90!! I'm not lucky at all, so I'm not too hopeful in winning this, but those of you that know me well know how much I need a new camera! The old Fuji with the delay just ain't cutting it for this girl!